The Kansas City Area Transit Authority has plans in the works for rerouting all of their buses onto what they are calling Transit Emphasis Corridors (TEC). The north-south routes will follow Grand and the east-west routes will follow 11th/12th. 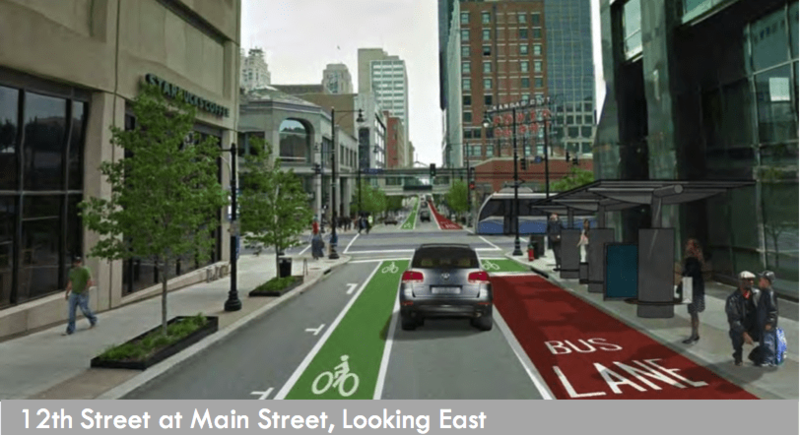 Besides the obvious connections transit has to walkability, these plans have implications for riding a bike in downtown. In both cases the TECs are also on the city’s bike plan. Bikes and buses have good reason to be on the same street. Besides the fact that the two transportation modes are very complimentary (bikes often serve the first and last mile of transit trips), things like topography, adjacent land use, and connectivity make it preferable to co-locate bike facilities with major bus routes. Additionally, transit emphasis corridors can replace some of the automobile traffic with buses which are driven by professional operators. This makes the situation safer for bikes and pedestrians. On two-way streets protected bike lanes are preferable. Vertical barriers between the bike lane and bus traffic make the ride safer for the people riding bikes and for the bus driver. Protected bike lanes also have a much better track record of increasing bicycle ridership. On a street like Grand, the bike lane could be nestled between on-street parking and the curb. 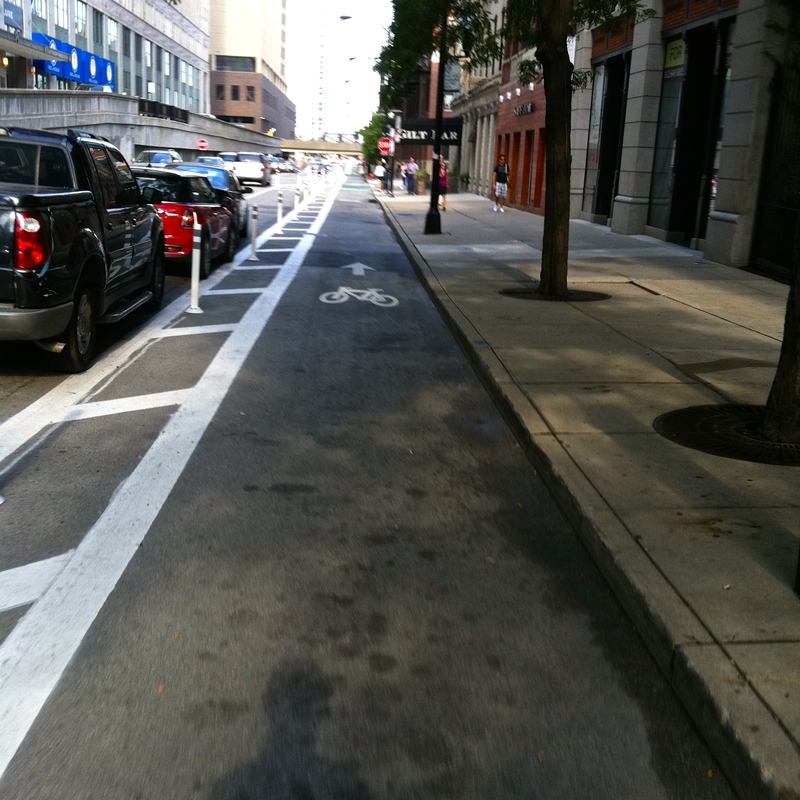 Learn more about protected bike lanes. Bike lanes should be routed behind the bus stop or streetcar platform. Below is a video of such a bike lane next to a MUNI stop in San Francisco with almost no special accommodations. It seems to work pretty well. The east-west TECs in downtown are one-way streets and are likely to remain that way. This makes the conflict between buses and bikes very easily resolved simply by putting the bike lane on the side opposite the bus stops. This leaves open the option of installing a dedicated bus lane and bike lanes without the conflicts between buses, bikes, and pedestrians. While the KCATA and KCMO Public Works continue to hash out the final designs of the TECs it is important to take stock in the fact that we have examples and guidance to ensure of the best possible design. Posted in Uncategorized and tagged advocacy, bike lanes, bus, education, KCATA, news, protected bike lanes, transit.